Buffalos off to state for first time since 2012; face No. 1 Rainier in rematch Nov. 2. 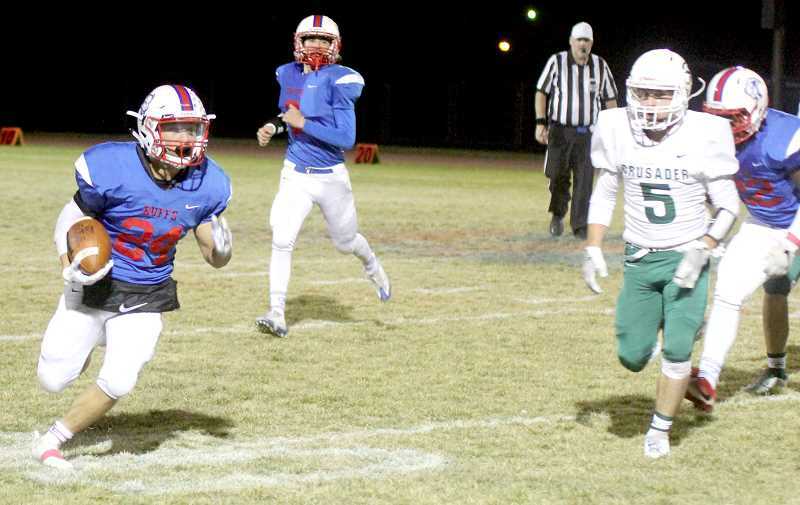 After beating Salem Academy 45-7 on Oct. 26, the Madras White Buffalo football program has made the state playoffs for the first time since 2012. They will travel to Rainier (9-0) and face the top- ranked 3A team on Nov. 2. The Buffs, who played Rainier at home on Sept. 14, and lost 28-6, will be looking for revenge this week. The team has momentum after winning four out of their last five games. The White Buffalos used a different look on offense and kept their stellar defense to crush the Crusaders on Friday. Madras has had a problem starting slow offensively this year, but made some adjustments to start the game. They changed their offense and ran the ball to the outside with toss plays. After recovering a Salem Academy onside kick attempt, running back Victor Torres ran the ball for an 18-yard gain. 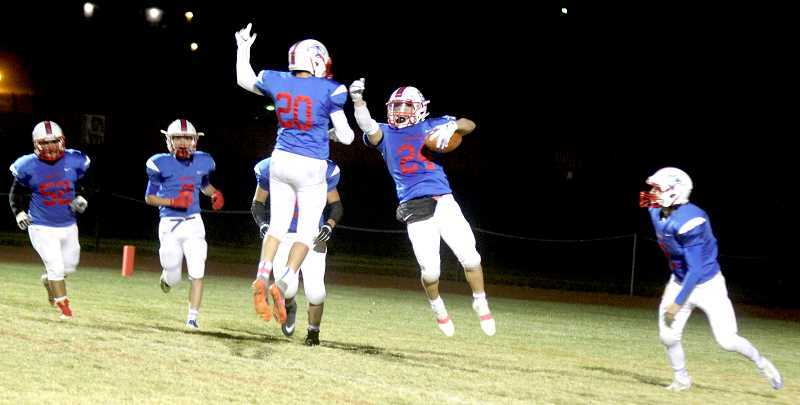 A holding call pushed the Buffs back to a second-and-20, but Madras quarterback Robert Pacheco ran the ball 18 yards. On fourth-and-1, Pacheco connected with a pass to senior wide receiver Coty Simmons for a first down. On another fourth down, the aggressive Buffs ran a designed QB run up the middle and Pacheco scored a 24-yard touchdown. The Crusaders were waiting for another outside run, which set up Pacheco in the middle. Madras kicker Kaegan Prevett made the extra-point and the Buffs took a 7-0 lead, with seven minutes left in the first quarter. The Buffs shut down the Crusaders on defense and forced a punt back to the Buffs. Torres started the drive with a 24-yard run to the outside. Pacheco ran the ball for 10 yards and 15 yards on back-to-back plays. A delay of game penalty on Madras put the Buffs in third-and-long and the team could not complete a pass for a first down. Prevett lined up for a 40-yard field goal and sent the ball straight through the uprights, making the score 10-0 with around three minutes left in the first quarter. Salem Academy found some success throwing the ball on offense, driving the ball down the field. On the 45-yard line, Madras stopped the Crusaders on third down and forced a punt. A 30-yard run by Treyvon Easterling ended the first quarter with the Buffs on their 38-yard line. A fumble on the snap was recovered by Salem Academy and their offense took the field. The Crusaders tried to pass the ball on the Madras secondary, but were completely shut down. Three incomplete passes set up a fourth-and-10 and the Crusaders decided to go for it. Salem Academy threw the ball deep down the middle of the field, but Liam White was there to break up the pass for the Buffs. A few possessions later, the Buffalo defense recovered a fumble and the offense took the field. On third-and-5, Pacheco ran the ball up the middle with Torres as lead blocker. Torres made a great block that sealed a Crusader defender, allowing Pacheco to break free down the sideline for an 84-yard touchdown run. Prevett's PAT gave Madras a 17-0 lead with about seven minutes left in the half. Another fumble recovery made by the Buffalo defense gave the ball back to their offense on their own 38-yard line. Pacheco dropped back to pass and threw the ball to his favorite target, Byron Patt. Patt made a diving catch for a 30-yard gain, putting the Buffalos in scoring position. A few plays later, Easterling punched the ball in the end zone of fourth-and-goal at the 2-yard line. Madras had a 24-0 lead after the made PAT. With short time on the clock, Madras was able to stop Salem Academy on another fourth-down attempt. The Buffs were around the midfield when Pacheco completed a quick pass to Kobey Jorgensen. Madras called a timeout to try to draw up a couple of plays before the half. Pacheco look down the field for a pass and with pressure coming, he stepped up in the pocket and launched a pass toward Patt. Patt leaped in the air, snagged the ball and ran in for a 42-yard touchdown catch with nine seconds left in the first half. The PAT was made and Madras took a 31-0 lead at halftime. "I try and give my receiver the ball before I do anything with it," Pacheco said. "I trust in all my receivers and try and do what I can do. That boy Byron (Patt) can adjust to anything. I can put it up there for him and he will do something with it." Most of the third quarter was a stalemate of offense. With a combination of good defense, penalties and fumbles, neither team was able to score until the final seconds of the third quarter. The Salem Academy quarterback completed a pass to Jacob Haller for a 24-yard touchdown throw. The score was 31-7 at the end of the third quarter. Torres led the Madras offense with a pair of 9-yard runs, before weaving through defenders and breaking tackles on a 24-yard touchdown run. After the made PAT, the Buffs had a 38-7 lead. Later in the game, Easterling ran the ball for 15 yards and the Buffs were able to put some substitutes in the game. Wessley Beymer carried half of the Crusader defense 16 yards on a powerful run. Beymer used his strength to put Madras at the 1-yard line, before Pacheco squeezed in the end zone for a score. 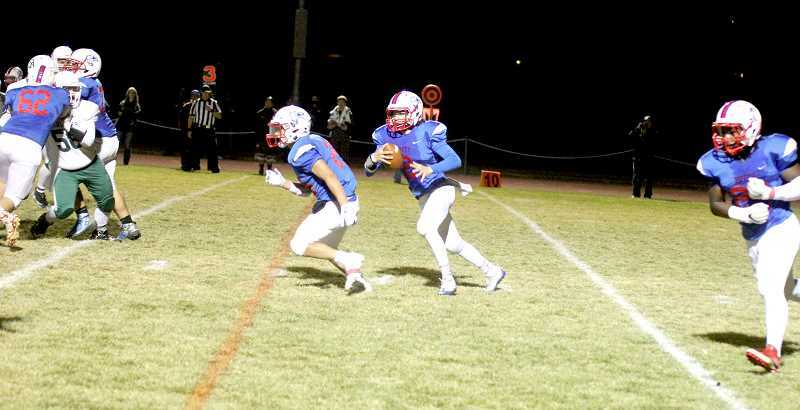 Madras beat Salem Academy 45-7 and ended the regular season with a 6-3 overall record, 4-1 in league. The Buffs had 477 total yards on offense, 115 in the air and 362 on the ground. Pacheco ended the game 6-9 with a 115 yards and a touchdown throwing the ball. He also led the team in rushing with 158 yards and three touchdowns on 12 attempts. "Knowing this was a big game, I had some pressure on me," Pacheco said. "I was nervous before the game, but knew I had to play hard for these seniors." 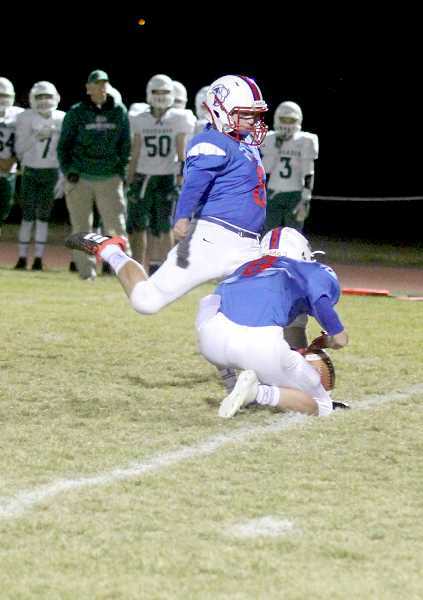 Madras kicker Kaegan Prevett ended the night perfect. He was 6-6 on PAT's and 1-1 on field goal attempts. "When I line up for a kick, I go through my fundamentals," Prevett said. "Head down, leg locked, eye on the ball, toe down and just hope my buddies can keep me protected. It feels really amazing to go out there with your boys and do something you love." 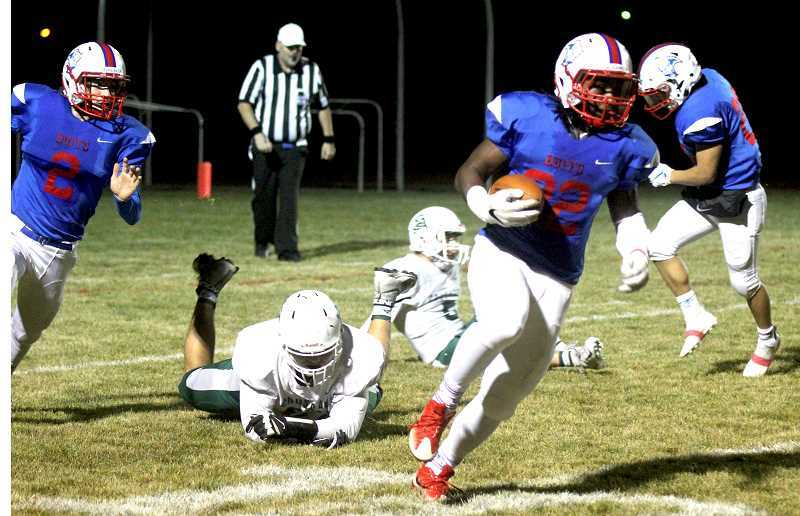 Torres ended the game with 104 rushing yards and a score and Eastering, 64 rushing yards and a touchdown. Beymer carried the ball four times for 39 yards. Patt led the team in receiving yards with 70 yards and a touchdown on only two catches. "This was something that we will never forget," Torres said. "None of these seniors are ever going to forget this. Could not have asked for a better senior night and could not have done this without this team." "It is a good feeling," Torres said about playoffs. "Postseason is a totally different story — it's a new season; your record starts over and I am just excited for the postseason. We'll put the work in and see how it goes." "We are going to keep working hard and if little mistakes happen, we need to flush them away," he said. "Work hard, be us, be Madras and put in work." "This is such a great feeling making the postseason," Easterling said. "We have been working so hard. We have been going hard in practice, having fun and focusing on us. We are focused on going as far as we can. I knew we could make it to the state playoffs and I believe in this team and everything we do." The last time the Madras football program had more than five wins was in 2004, when they also ended with a 6-3 regular season record. "This was a lot of hard work paying off," head coach Kurt Taylor said. "Three years in the making and honestly, this happened a lot sooner than I thought it would. We tell the boys, plant the root, take care of the root and you will get the fruit." "I am very, very proud of our boys," he said. "I can't even begin to tell you how proud I am. To go from where we were to where we are at now is unbelievable." "I am proud of all our seniors, Allen Jackson, Dalton Waldo, Wessley Beymer, Gary Katchia, Coty Simmons and James Williams," he said. "Those guys have been in the program all four years, through the darkest times, and stuck with it and now get to see some neat things." "You want to be in a place of confidence heading into the playoffs and that is where we are at," said Taylor. "We are confident and more poised than we've ever been. We are playing our best football right when it matters the most."